The large 7” color TFT touch LCD offers intuitive operation of functions, settings, and various operational visual aids such as dual spectrum scope aligned vertically or horizontally, simulated analog meters and RTTY, PSK31/63 mode decoded messages.The combination of the touch screen and the multi-dial knob offers quick and smooth operation. When you push the multi-dial knob, menu items are shown on the right side of the display. You can select an item by touching the screen and can adjust the levels by turning the multi-dial knob. The RF direct sampling system directly converts the analog signals to digital signals, and collectively puts the data through FPGA (Field Programmable Gate Array) processing. The master clock uses a high precision oscillator which excels in low-noise characteristics. 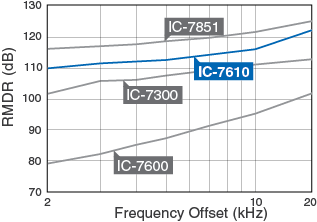 This makes it possible to provide superior receive and transmit performance, extremely low phase noise as well as high RMDR (Reciprocal Mixing Dynamic Range). * At 2 kHz frequency separation. Both main and sub receivers are equipped with DIGI-SEL (digital preselector) units. 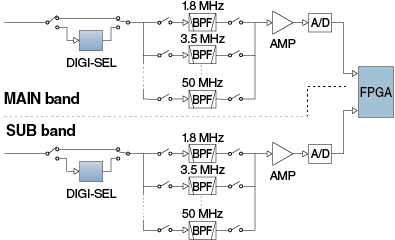 The DIGI-SEL has steeper skirt characteristics than normal bandpass filters, so it rejects out of band strong interference such as broadcast stations, and prevents cross modulation. 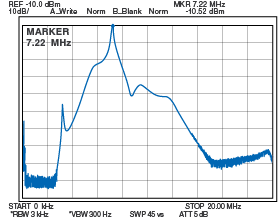 The real-time spectrum scope of the IC-7610 shows main and sub band conditions. It provides class-leading performance in resolution, sweep speed and a 100 dB of dynamic range. The waterfall screen allows you to find weak signals by showing spectrum change over time. The audio scope function shows the FFT scope and oscilloscope. The large 7-inch color display shows various operating and setting information at a glance in high resolution (800 × 480 pixels). The combination of the touch screen and the Multi-function control knob offers smooth, intuitive and speedy operation. SD card for saving various setting information and recording communications* * An SD card is required separately. 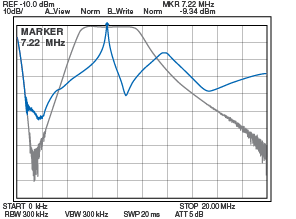 0.030 - 60.00 MHz * Guaranteed range: 0.500 - 29.999, 50.000-54.000 MHz. 1.800 - 1.999, 3.500 - 3.999, 5.255 - 5.405* Some frequency bands are not guaranteed.